VERNON, NY- After a late race disappointment last week, Bobby Varin held on for the win this past Sunday, July 22, in the DirtTrackDigest.com 358-Modifieds on Marble Hill Inn night. Dave Marcuccilli would take another win in the $1,000 Mike Martin Memorial for the Broedel Energy Sportsman while Rich Crane dominated the King of Dirt Pro Stock Series event. The Rookie Sportsman main event was halted by rain. Jack Miller and Billy Whittaker led the DirtTrackDigest.com 358-Modified field to the green flag with Whittaker shown atop of the scoreboard at the completion of lap one. Fourth place starter Lance Willix would take over the lead on lap two with eighth place starter Bobby Varin passing Whittaker for second on lap three. Varin then set his sights on leader Willix and on lap five and six, Varin and Willix would trade slide jobs with Varin gaining the top spot on lap seven. On lap nine, Bobby Herrington took the runner-up spot from Willix and looked to track down the leader. With the halfway sign being shown to the field, it was Varin showing the way over Herrington, Willix, 14th place starter Mike Mahaney, and Whittaker. On lap 18, the only caution of the 30-lap affair slowed the pace, and on the restart, Mahaney would continue his charge to the front as he took to the outside lane and passed Willix for third on lap 19. On lap 20, Mahaney dispensed with Herrington and started to track down Varin. With two laps to go, Mahaney would finally pull alongside Varin down the back stretch in a bid for the lead. Going into turn three, a lapped car would hinder Mahaney’s charge to the front as Varin used the slower car as a pick. Varin would lead the rest of the way with Billy Dunn making a late race charge to grab second at the line. Herrington finished third, Pat Ward was fourth while Mahaney limped across the line in fifth with a flat right rear tire. Rounding out the top 10 was Willix, Whittaker, Glenn Forward, Jack Lehner, and Marc Johnson. In the Mike Martin Memorial for the Broedel Energy Sportsman, Kevin Root led the opening laps of the 20-lap main event from his pole starting spot. A dogfight for the runner-up spot raged on between Charlie Tibbitts, Matt Janczuk, and Dave Marcuccilli, and on lap eight, Marcuccilli grabbed the spot for good. Once in second, Marcuccilli set off after Root and by lap 13, he made the pass on Root for the lead. Marcuccilli would lead the rest of the way for the $1,000 to win event with Root, Matt Janczuk, Tibbitts, and AJ Filbeck chasing. Rich Crane launched from his eighth place starting spot at the drop of the green in the 40-lap King of Dirt Pro Stock Series feature event to grab the lead at the conclusion of lap one. Crane would open up a several second lead in the early going while several battles for position raged on behind him. Fifth place starter Pete Stefanski would be the first to break out of the pack as he grabbed the runner-up spot on lap seven. At the halfway point of the non-stop event, Crane was still way out front with Stefanski, Shane Henderson, Jay Casey, and Jon Routhier rounding out the top five. With 10 laps to go, Stefanski started to turn up the wick as he began to cut into Crane’s lead but he would run out of laps as Crane took the big win over Stefanski, Chuck Dumblewski, Routhier, and Henderson. The rain came during and stopped the racing action on lap one of the Rookie Sportsman. Racing at the Utica-Rome Speedway doesn’t return until Sunday, August 5, when Northeast Racing Products and Power Seal present the annual Night of Legends featuring the 8th Annual Jan Corcoran Memorial Big Block/Small Block Challenge that pay $3,064 to the winner of the 50-lap main event. The top finishing small block with receive a $640 bonus. 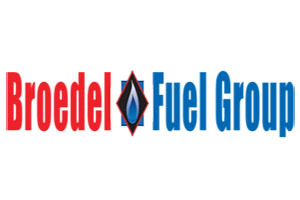 The Broedel Energy Sportsman will compete in a $640 to win, $64 to start feature event plus a weekly show for the Ted’s Body Shop Pro Stocks and Rookie Sportsman. The Dirt Modified Nostalgia Tour Vintage Series will also be on hand. 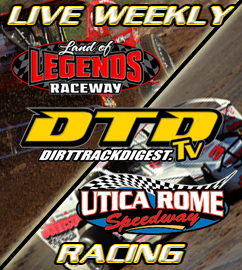 Gates will open at 4 p.m. with racing at 7 p.m. For more information, please log on to www.uticaromespeedway.com or visit us on Facebook and Twitter. 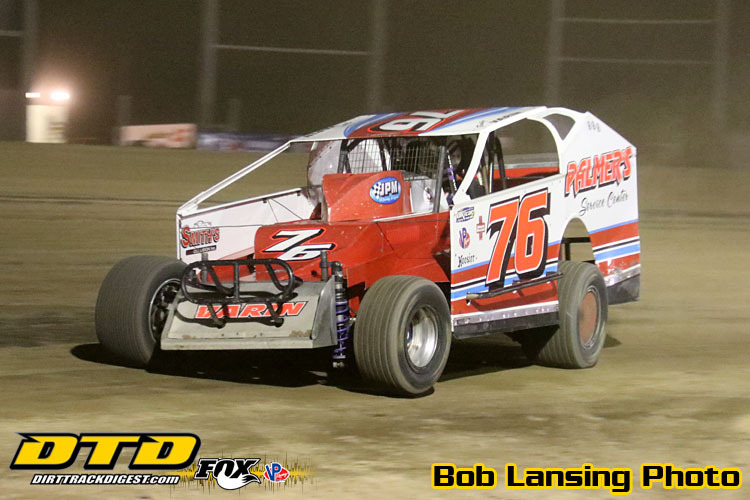 DIRTTRACKDIGEST.COM MODIFIED FEATURE FINISH (30 LAPS)-BOBBY VARIN, Billy Dunn, Bobby Herrington, Pat Ward, Mike Mahaney, Lance Willix, Billy Whittaker, Glenn Forward, Jack Lehner, Marc Johnson, Rocky Warner, Eldon Payne Jr., Jeremy Wilder, Steve Way, Billy Shantel Jr., Jack Miller, Lucas Heintz, Aaron Jacobs, Randy Shantel, and Brian Murphy. BROEDEL ENERGY MIKE MARTIN MEMORIAL SPORTSMAN FEATURE FINISH (20 LAPS)-DAVE MARCUCCILLI, Kevin Root, Matt Janczuk, Charlie Tibbitts, AJ Filbeck, Rocco Leone, Kyle Inman, Chris Cunningham, Mike Button, Tony Finch II, Matt Steffenhagen, Andrew Buff, Dave Moyer, Jeff Taylor, AJ Miller, Brian Hudson, Taylor Lamb, Mark Effner, AJ Digsby, CJ Castelletti, Jeremy Nestved, Isiah Forward, John Strickler, Teddy Starr, George Dyer, and Carl Inman. DQ-Stephen Denton. KING OF DIRT PRO STOCK SERIES FEATURE FINISH (30 LAPS)-RICH CRANE, Pete Stefanski, Chuck Dumblewski, Jon Routhier, Shane Henderson, Jay Casey, Jason Casey, Mike Welch, Bill Knapp, Travis Welch, Sid Harmer Jr., Mike Kazlauskas, Devon Camenga, Ernie Staelens, and Jason Meltz. ROOKIE SPORTSMAN FEATURE FINISH (15 LAPS)-Rain.